SOUTHINGTON - At the start of his senior season, Southington wide receiver and defensive back Will Downes thought he might be embarking on a farewell tour from football. Ten wins and a number of brilliant catches later, and Downes’ thought process changed. As Downes helped lead Southington to perfect 10-0 regular season, thoughts of a future in football began to surface. Those beliefs materialized into reality on Wednesday afternoon, when Downes inked a commitment to play football at Marist College in front of his family, coaches and teammates inside the Southington High School library. Downes will turn in the Blue Knights uniform for the Red Foxes come next fall, but traces of Southington will be scattered throughout Marist’s roster, with Downes being the most recent addition of Southington alumni to play football in Poughkeepsie, NY. Sam and Matt Thomson, both Southington graduates, currently play defense at Marist, while Southington head coach Mike Drury graduated from Marist himself. 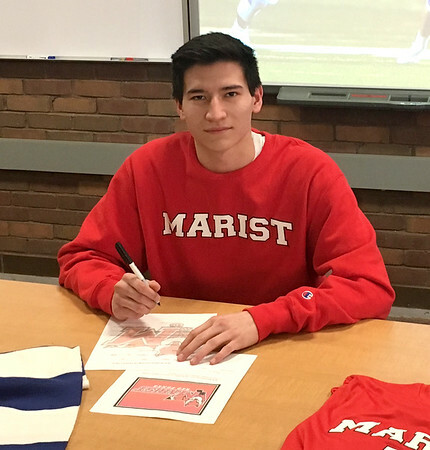 The decision for Downes wasn’t an easy one, as he found himself deciding between Marist and Bentley University after returning from visits to both schools. Ultimately, the draw of Marist and its welcoming familiarity proved to the decisive factor. As Downes signed his letter of intent, his coaches and teammates marveled at his future while reflecting on his past, and the moments that helped spark the chance at a college career. For Drury, a thrilling night in New Britain this past October stood out the most. Down three with 1:34 left in regulation, the Blue Knights put together a game-winning, 80-yard drive behind two spectacular catches from Downes, a first-down reception where Downes leapt over defender to make the grab, and another at the pylon to set Southington up for a touchdown run to keep its undefeated season alive. The thrilling comeback for Southington was just one of a number of moments that caused Downes to rethink his future. After all, shocking an undefeated New Britain team with two circus catches en route to a 10-0 season is enough to feel optimistic about extending a football career. However, Downes feels prepared for the next level not necessarily because of the moments on the field, but the program itself that gave him the opportunity to succeed on the gridiron. Posted in The Bristol Press, Southington on Wednesday, 6 February 2019 21:52. Updated: Wednesday, 6 February 2019 21:55.